All this is true, the only problem is that the objects still disappear when using OGSSAA (specifically "2x2 (2x2 Supersampling)" option in nVidia inspector. The behavior is identical, no matter what AA type is used - MSAA, OGSSAA, or SGSSAA. I wonder if anyone experimented with injecting FXAA or SMAA (FXAA set from nvidia control panel does not work). I assume someone did, and it did not work, otherwise we'd hear about it. A long time ago in a forum far, far away someone fixed AA for the 4CD version by modifying the DX_module file. But I don't know the details of those modification, and that forum is gone now. They're referencing it here. That thread is almost ten years old, it was before the release of Windows Vista, so ancient history. Even if that fix worked back then, there is a very slim chance that it would work now. From what I understand, it was nvidia drivers that at some point broke AA in the game, but nvidia does not care. It's mostly been broken since the release of XP. My point was not that it's is a solution as it stands, but that if it was possible to modify the DX_module.dll back then it is still possible. If anyone have the technical know-how required. That's probably the only durable solution. Good AA solution for TLJ on nvidia cards has been a sort of Holy Grail for the past couple of years. And it is nowhere to be seen, which means that getting AA to work on current nvidia cards and windows version is very difficult, if not impossible. I would gladly test that modified DX_module.dll file, but from what I understand it disappeared along with the site. Releasing 2CD/DVD version also broke some previously working community fixes, so that's another issue. I am still counting on Funcom releasing remastered TLJ for iOS on Android and/or PC. I'm afraid that's the only option of getting decently running TLJ on modern machines. EDIT: I read the thread and from what I understood, the DX_module.dll file was not modified, but it was from a different version of the game. People were experimenting by trial and error, trying different versions of dll and exe (patched, unpatched, from the demo) file in various combinations and one of these combinations worked. But that was almost 10 years ago, so like I said, there is no guarantee that the same fixes would work today. I am almost certain nvidia made changes to their drivers which made AA in TLJ an impossibility. Funcom has released TLJ for iOS, which does feature anti aliasing and a touch-friendly interface. There are no other changes, though. I'm pretty sure we did have one that was modified floating around years ago. But that is like 10 years ago now, so my memory could be faulty. I know they released on iOS, my wording was ambiguous. "I am still counting on Funcom releasing remastered TLJ for iOS on Android and/or PC. I'm afraid that's the only option of getting decently running TLJ on modern machines." - imagine that "TLJ for iOS" is the name of the app - that was my intention Sorry for confusion. I tried asking them for release date, but got no specific information. I wonder why are they keeping it exclusive to iOS. It's the biggest market. They're probably unsure if an android port will generate more revenue than what the port will cost. I would assume, that the biggest cost (preparing the iOS version) was already incurred, and Android port of iOS app would cost a fraction of the initial cost. But I may be wrong, or they are afraid of piracy. The game already exists on PC and it works on modern computers. It's just the anti aliasing missing. There's no untapped market there. As for the cost, that depends on how it was done. If the iOS port was made with other OSes in mind, so that the incorporated most of the new code into the main engine and kept the iOS specific code separate, then it wouldn't be a very great effort to also bring it to Android and Windows Phone (if that's even relevant still?). If they didn't make the port with that goal in mind, it could be very expensive. I won't be getting an iPad either. You're right, however the original version is not modern OS friendly, runs in 640x480, crashes, so I would not consider it fully playable without problems. I think that with the rekindled interest in Dreamfall universe thanks to Dreamfall chapters, a moderately priced remaster could sell. Grim fandango, another popular adventure game from that time was recently released as a remaster on PC so this proves that there is a market for such remasters. 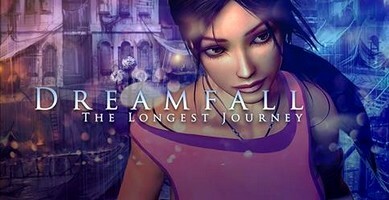 I would definitely buy TLJ Remastered and I suppose other Dreamfall fans would too. But maybe I am just biased, thinking that if I am interested in it, than many other people are also interested. I would buy a remastered version too, even if all that was changed was for it to run better in windowed mode (allowing the window to be resized) and AA on the models. However the 2CD/DVD/GOG/Steam version was patched to run on Vista, and most people experience no problems with it. I am not sure if original Grim Fandango is still playable on modern PCs, probably not, but there is a Virtual Machine GrimE that makes it playable. The version on GOG works with Nvidia AA finally! I have a 980 TI, and I made a profile with nvidia inspector, set the AA to 4x4 Supersample, set the game to full screen in profile.ini,and voila! It works! No flickering, no missing objects. Just the best it's ever looked. EDIT: This page says it's "completable with glitches" and it's fairly recent (January) so I guess they're still working on it! Hopefully it will be fully supported not too long from now. What drivers and what operating system do you use? 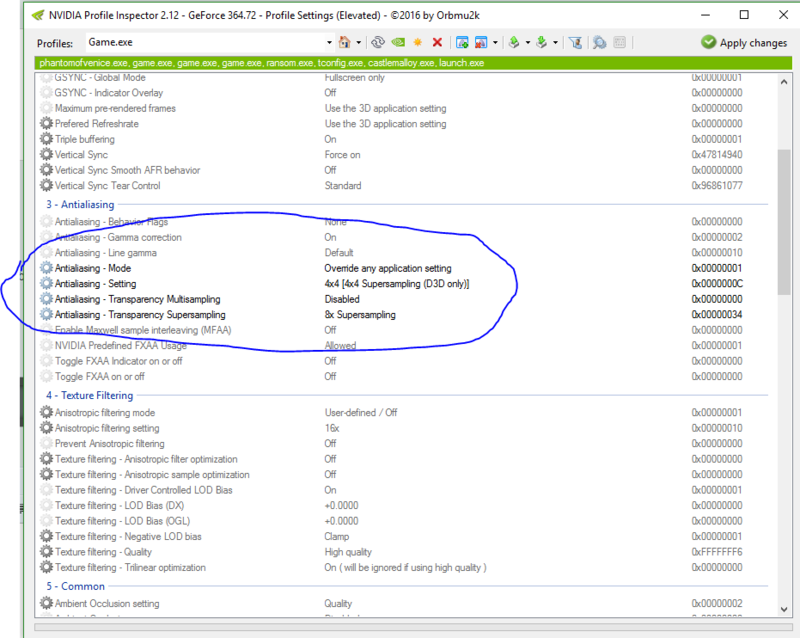 What are your exact settings in nvidia inspector and in profile.ini? Which ones do you have enabled and which ones disabled? Oops yes I mean preferences.ini. I am using Windows 10 Home x64, and version 364.72 Nvidia Drivers. 980 TI SLI. This is my whole file. I also have a modified gpu.ini for a different font. Here is a link to the album! The only lacking thing now is resolution for the whole game, obviously that is stuck in 640x480 still, but lucky for me, my monitor is 2560x1440, so when I stretch to aspect ratio, I get 1920x1440, which is exactly a scale of 3x. An exact scale makes it look much better. For example if I had only 1080p monitor that is a scale of 2.25, and thus does not scale as nicely and adds blur. Wow, it actually seems to really work. When? How? I tried to get proper AA in TLJ for YEARS. I finally caved in a few months ago, borrowed iPad from a friend, bought and completed the game once again (a refresher befor Dreamfall: Chapters). I wonder what changed that AA is now working? Is it an update of the GoG version? Update of nvidia drivers? Really curious as to what miracle is this.